2013 Color Me Rad Raleigh 5K Race Free Registration Giveaway! Get ready to run! 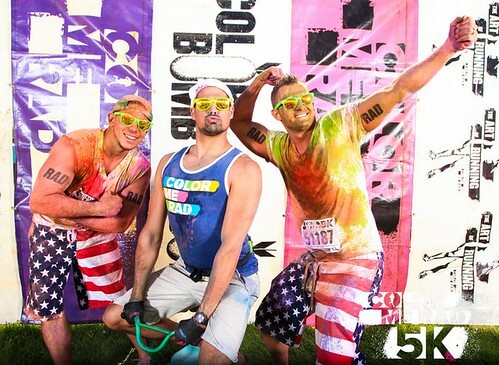 Color Me Rad Raleigh returns to the Triangle this fall on Saturday October 26th at the Time Warner Cable Music Pavilion in Raleigh. Runners of all abilities are welcome at this 5K. Whether you are a seasoned runner or just looking for a fun way to experience your first 5K racewith friends and family (children 7 and under can race for free) this race is sure to be a lot of fun all while helping a great cause with a portion of the proceeds from the race benefiting the Special Olympics of NC. During the race runners are bombarded with a rainbow of colors (colored corn starch) at various color stations along the running route. According to their website, the race “runners getting plastered with paint every 5 minutes. You’ll end up looking like a kindergarten art class gone wrong…” You can view the course map and color station locations here. The great people organizing Color Me Rad Raleigh were awesome enough to donate Four Free Registrations for me to give away to lucky Triangle Explorer blog readers! To enter the giveaway just leave a comment below about why you like to run or share this post on twitter (copying me @trianglexplorer & @colormerad5k). I will randomly select the four lucky winners on Tuesday June 18th and notify them by email with the promo codes. 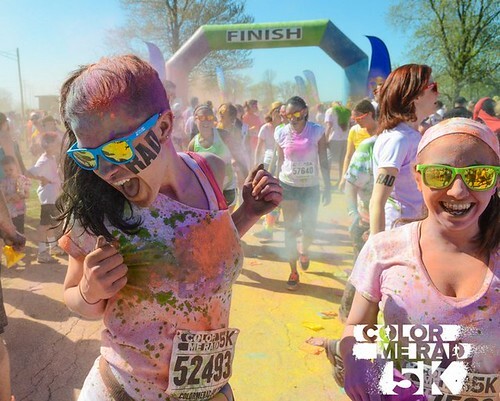 In the meantime, for more information about the Color Me Rad Raleigh 5K race, check out the event website here and follow them on their facebook page and on twitter @colormerad5k for race updates. I love running because it feels great and helps rid of all that nasty stress!! Color ME Rad!!! I like to run because although I am still not a runner I CAN run.. I have lost 60 pounds now want to RUN.. I would never even try doing a 5k in the past. I want to bring my family and experience this together. Choose me and I will run with my spunky 7 yr old daughter! Love to run because I get to be outside, it lets me rest my mind after a long day of work, or start the day energized and focused. Love how great I feel after every run. I would love to run this crazy race, it is an expensive race so doing it for free would be awesome! When I run it helps motivate my kids to be active. They often join me or ride their bikes beside me! I would love to win this as it would be my first 5k – what a fun way to do my first run! I’m learning to love running. 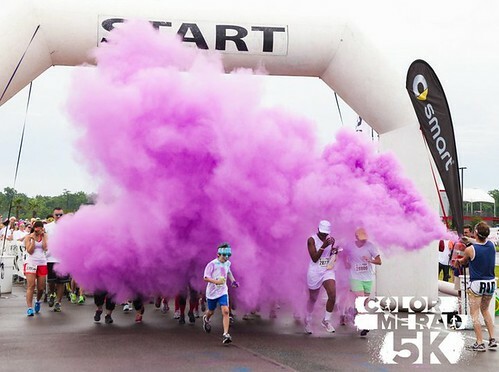 I’ve been thinking of maybe the Color Me Rad run being my first 5k! My daughter volunteers for the Special Olympics and I have recently began running specifically for this event!! Bringing along my running buddies too!! Can’t wait! I run to clear my head – nothing like a good run outside to make you feel better! I showed this post to my sons and they were really excited about the idea of running in this race. They love the idea of getting plastered with paint. Looks like a lot of fun! Oops, I didn’t really answer the question you asked. Sorry! I like to run to relieve stress and just clear my head. I like to run because it allows me to escape the monotony of my everyday routine! Plus all of the endorphins are awesome!! Color ME Rad!!! I would love to win tickets to this race. I was re-acquainted with a high school friend who, remarkably, is in Raleigh- we are from Ohio. She was homeless but has recently found a shelter to live in temporarily.Her home has a treadmill and she can run 2 miles. She has expressed a desire to run this race. Her shelter has a treadmill and she can run 2 miles. With your help, we could give her motivation to keep going and an experience that she would truly treasure. My coworkers and I were just talking about wanting to “run” together! I think any event that you can do together that betters your health is great. My 11yr old & 5 yr old girls are just getting into running. This would be great mother daughter time and awesome motivation for her 1ST official race! I’ve been training for a 5K and this would be a great one to enter. I just started Couch to 5k again after an injury, so I want to have something to work towards. This looks like fun!